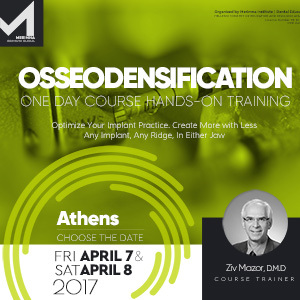 This whole-day training will minimize the learning curve and help understand the science behind Osseodensification. Didactic Scientific learning and Hands-on Practical Training. 2. Describe implant micro-motion and its clinical significance. 3. Learn how bone can be optimized with adequate instrumentation. II- Discuss the Biomechanical validation of Osseodensification. III- Review the Clinical and the Histological evidence of Osseodensification. 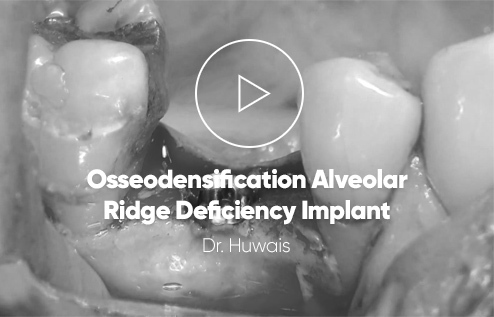 V- Learn how to optimize the implant practice to Create More with Less. demonstrating the clinical uses of the concept. The program requires 3 hours of didactic scientific education and clinical cases review as well as additional 2 hours of hands-on simulation with actual bone specimens and simulation models. 2 Review Densification Guide for any implant system. 3 Site optimization utilizing the Densah® Bur to increase Implant Stability. 4 Sub-Crestal Sinus Autografting Procedure. 6 Ridge Expansion and the Plus1® Protocol. 20 Θέσεις ανά ημέρα (για την ιδανική διεξαγωγή του πρακτικού σεμιναρίου). 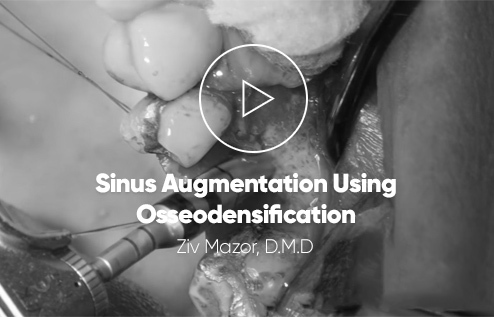 Prof. Ziv Mazor is one of Israel’s leading periodontists. He graduated from the periodontal department at the Hadassah School for Dental Medicine in Jerusalem, where he served as a clinical instructor and lecturer for undergraduate and postgraduate dental students. Since 1993, Prof. Mazor has been engaged in clinical research in the field of Bone Augmentation and Sinus Floor Elevation. He is currently participating in the quest for improving and evaluating new grafting materials, using various growth factors as well as researching “osseodensification”- a paradigm shift in dental implantology. Prof. Mazor is a renowned author in dental implantology, and is known worldwide for his innovative approaches in cutting-edge procedures and technologies. He is a world known speaker and has lectured extensively both nationally and internationally. Prof. Mazor is part of the continuing education faculty at the New York University and an Associate Professor at Titu Maiorescu University in Bucharest, Romania. He conducts and moderates advanced international implantology courses and workshops. He is the past President of the Israeli Periodontal Society.Prof. Mazor serves on the editorial board of several international dental journals. He is an active member in numerous societies, such as: AAP (American Academy of Periodontology), AO (Academy of Osseointegration), EFP (European Federation of Periodontology) and ICOI (International Congress of Oral Imlantologists). Prof. Mazor maintains a private practice limited to periodontal and implant dentistry in Ra’anana, Israel. Παρακαλώ επιλέξτε μία από τις δύο διαθέσιμες ημέρες.